Ravens are common characters in the traditional narratives and mythology around the world, notably a part of North American, Siberian, and Norse mythology. Besides being the representative spirit of actual ravens, the raven in mythology is often depicted as a trickster or culture hero figure, or even as the creator of human beings. Raven at the Headwaters of Nass hat, Seattle Art Museum, attributed to Kadyisdu.axch', Tlingit, Kiks.ádi clan, active late 18th – early 19th century. There are human figures crouching within Raven's ears. The addition of the Raven trying to succeed to capture the sun, star, and moon. The raven is doing it for his people. A raven story from the Puget Sound region describes the "Raven" as having originally lived in the land of spirits (literally bird land) that existed before the world of humans. One day the Raven became so bored with bird land that he flew away, carrying a stone in his beak. When the Raven became tired of carrying the stone and dropped it, the stone fell into the ocean and expanded until it formed the firmament on which humans now live. In the creator role, and in the Raven's role as the totem and ancestor of one of the four northwest clan houses, the Raven is often addressed as Grandfather Raven. It is not clear whether this form of address is intended to refer to a creator Raven who is different from the trickster Raven, or if it is just a vain attempt to encourage the trickster spirit to act respectably. Bill Reid created the sculpture of The Raven and The First Men depicting a scene from a Haida myth that unifies the Raven as both the trickster and the creator. According to this myth, the raven who was both bored and well fed, found and freed some creatures trapped in a clam. These scared and timid beings were the first men of the world, and they were coaxed out of the clam shell by the raven. Soon the raven was bored with these creatures and planned to return them to their shell. Instead, the raven decided to search for the female counterparts of these male beings. The raven found some female humans trapped in a chiton, freed them, and was entertained as the two sexes met and began to interact. The raven, always known as a trickster, was responsible for the pairing of humans and felt very protective of them. With the Raven perceived as the creator, many Haida myths and legends often suggest the raven as a provider to mankind. Is based on the archetypes of The outcast archetypes. This is an ancient story told on the Queen Charlotte Islands and includes how Raven helped to bring the Sun, Moon, Stars, Fresh Water, and Fire to the world. Long ago, near the beginning of the world, Gray Eagle was the guardian of the Sun, Moon and Stars, of fresh water, and of fire. Gray Eagle hated people so much that he kept these things hidden. People lived in darkness, without fire and without fresh water. Gray Eagle had a beautiful daughter, and Raven fell in love with her. In the beginning, Raven was a snow-white bird, and as a such, he pleased Gray Eagle's daughter. She invited him to her father's longhouse. When Raven saw the Sun, Moon and stars, and fresh water hanging on the sides of Eagle's lodge, he knew what he should do. He watched for his chance to seize them when no one was looking. He stole all of them, and a brand of fire also, and flew out of the longhouse through the smoke hole. As soon as Raven got outside he hung the Sun up in the sky. It made so much light that he was able to fly far out to an island in the middle of the ocean. When the Sun set, he fastened the Moon up in the sky and hung the stars around in different places. By this new light he kept on flying, carrying with him the fresh water and the brand of fire he had stolen. He flew back over the land. When he had reached the right place, he dropped all the water he had stolen. It fell to the ground and there became the source of all the fresh-water streams and lakes in the world. Then Raven flew on, holding the brand of fire in his bill. The smoke from the fire blew back over his white feathers and made them black. When his bill began to burn, he had to drop the firebrand. It struck rocks and hid itself within them. That is why, if you strike two stones together, sparks of fire will drop out. In one common North American story, Raven plays a vain and regretful Chief in a moral tale somewhat analogous to The Little Boy who Cried Wolf. As told by the Ktunaxa (Kutenai), the people tried to convince Chief Raven that everyone should get two lives. But Raven (also the bird/manitou Raven) selfishly preferred that people and animals only get one life. This is because Raven is known to like eating the eyes of carrion. As Raven was chief and had spoken, the decision was accepted. The people were upset, however, and decided to make Raven regret his decision. Raven's son was killed in an arranged arrow target-practice mishap. A tree was felled that struck and killed his daughter. When this happened, Raven tried in vain to reverse his decision so that everybody would get two lives. But he was reminded, "You are the chief, and you've already spoken". Another legend from the native peoples of the Pacific Northwest tells of how at the beginning of the world, Raven was the one who brought light to the darkness. When the Great Spirit created all things he kept them separate and stored in cedar boxes. The Great Spirit gifted these boxes to the animals who existed before humans. When the animals opened the boxes all the things that comprise the world came into being. The boxes held such things as mountains, fire, water, wind and seeds for all the plants. One such box, which was given to Seagull, contained all the light of the world. Seagull coveted his box and refused to open it, clutching it under his wing. All the people asked Raven to persuade Seagull to open it and release the light. Despite begging, demanding, flattering and trying to trick him into opening the box, Seagull still refused. Finally Raven became angry and frustrated, and stuck a thorn in Seagull's foot. Raven pushed the thorn in deeper until the pain caused Seagull to drop the box. Then out of the box came the sun, moon and stars that brought light to the world and allowed the first day to begin. 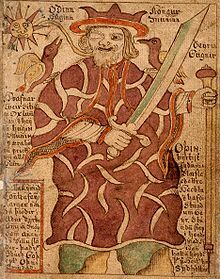 An illustration from an 18th century Icelandic manuscript depicting Huginn and Muninn sitting on the shoulders of Odin. To the Germanic peoples, Odin was often associated with ravens. Examples include depictions of figures often identified as Odin appear flanked with two birds on a 6th century bracteate and on a 7th century helmet plate from Vendel, Sweden. In later Norse mythology, Odin is described as having two ravens Huginn and Muninn serving as his eyes and ears - Huginn being referred to as thought and Muninn as memory. Every day the ravens fly out from Hliðskjálf and bring Odin news from Midgard. In Irish mythology ravens are associated with warfare and the battleground in the figures of Badb and Morrígan. Welsh mythology features Bran the Blessed, whose name means "raven" or "crow". He is depicted as giant and the King of the Britons in tale known as the Second Branch of the Mabinogi. Several other characters in Welsh mythology share his name, and ravens figure prominently in the 12th or 13th century text The Dream of Rhonabwy, as the army of King Arthur's knight Owain. There is a story that England will fall if ever the ravens abandon the Tower of London. Bran the Blessed is associated with the Tower of London in the Welsh Triads, which might be the origin of the story. In the Talmud, the raven is described as having been only one of three beings on Noah's Ark that copulated during the flood and so was punished. The Rabbis believed that the Raven was forced to ejaculate its seed into the female raven's mouth as a means of reproduction. In I Kings 17:4-6, the prophet Elijah hides in the wilderness, where he is fed by ravens. Claude Lévi-Strauss, French anthropologist proposed a structuralist theory that suggests the raven (like the coyote) obtained mythic status because he was a mediator animal between life and death. Miwok Mythology - "How Ravens Became People"
^ Clark, Ella E.: Indian Legends of the Pacific Northwest, University of California Press, 1953. ^ Told by Barnaby of St Mary's Band; published in Boas, Franz (1918) "Kutenai Tales", p. 213, Smithsonian Institution, Bureau of American Ethnology Bulletin 69, Washington. ^ "The Tower of London". AboutBritain.com. Retrieved 2007-03-03. "...legend has it that, if they leave, the kingdom will fall." ^ Lévi-Strauss, Claude. Structural Anthropology. Trans. Claire Jacobson. New York: Basic Books, 1963. In most parts of the world the raven is considered a prophet and a bad omen. The Arabs call it Abu Zajir which means "Father of Omens." In Ireland it was once domesticated for use in divination practices and the term "Raven's Knowledge" was applied to the human gift of second sight. Ravens deserting their nests were very bad omens and popular superstition declared that if the ravens ever fled the Tower of London, the monarchy would fall. In many areas of the ancient world, the sight of a raven flying to the right was a good omen, whilst a raven flying to the left was an evil one. Eaters of carrion, ravens were messengers of death, pestilence, and battle. It was believed that these flesh-hungry birds could smell the scent of death upon a person before they died - even through the walls of a house. In paintings, the raven may be seen flying over battlefields, eager to feast on the dead. After the Battle of Armageddon, ravens will descend upon the lands of the wicked (Isa 34:11). These birds were thought to have a special taste for the bodies of hanged criminals and to enjoy plucking out the eyes of sinners (Prov 30:17). Christians thought they carried off the souls of the damned and associated this bird with the Fall of Man and Satan who blinds sinners, dulls their moral senses, and feasts on their corruption. Ravens were a symbol of sin especially the sins of gluttony, stealing, and false teaching. They were nicknamed "thieving birds" and Icelandic children were taught that drinking from raven quill straws would cause them to become thieves. Evil priests were said to turn into ravens when they died. To European Christians, this creature is the antithesis of the innocent white dove. But in some African and Native American traditions, he is a beneficent guide whose keen sight allows him to issue warnings to the living and to lead the dead on their final journey. The raven's cry of "Cras! Cras!" was interpreted by Latin speakers to mean "Tomorrow! Tomorrow!" Therefore it became a symbol of the foolish sinner who puts off conversion. Others, however, found in this cry a symbol of the hope of a new and better day. To North American Eskimos, the raven's cry sounded like "Kak, kak, kak!" which means "a deer-skin blanket." According to their legends, the raven's cries warned people not to forget their blankets when they moved. Before Noah sent the dove from the Ark, he sent out a white raven to test the waters. Instead of returning to the Ark, this bird "kept going to and fro until the waters had dried up from the earth" (Gen 8:7). According to Matthew Henry, this raven's attitude was like that of the "carnal heart" which, instead of seeking rest and refuge in its Savior, "takes up with the world, and feeds on the carrion it finds there." Jewish legend states that Noah's raven was punished for his failure to return to the Ark by being blackened and condemned to eat carrion. Greeks believed that Apollo turned the raven black when the bird informed him of the unfaithfulness of his lover, Coronis. This episode gave the raven a reputation as a tattler, a spy, and a divulger of secrets. In the Pacific Northwest, the raven's feathers were blackened when his brother-in-law smoked him over a fire as a punishment for his trickery. According to Ukrainian legend, ravens used to have many beautifully colored feathers and a lovely song but after the Fall they started eating carrion. This habit destroyed their voices and blackened their plumage. Their former loveliness is expected to be returned to them when Paradise is restored. In Norse mythology the omniscient god Odin had a pair of ravens called Hugin (thought) and Munin (remembrance) living upon his shoulders or throne. Each morning they flew around the earth observing everything and questioning everyone, even the dead. During the night they returned to their master and whispered all that they had seen and heard. Sometimes Odin turned himself into a raven. Ravens are known around the world as shapeshifters and humans are often changed into ravens by an enemy's curse. They are prophets, spell-casters, and messengers of the gods. Gods and goddesses of war and thunder such as Badb have ravens as their attributes. They are early emblems of the Danes and the Vikings. In spite of its dark appearance, the raven is often a solar symbol. In Greece he was sacred to Apollo, the god of light. In China, a three-legged raven lives in the sun. His legs symbolize dawn, noon, and dusk. There used to be ten sun-ravens but they gave off such intense light and heat that an archer had to shoot nine of them in order to preserve life on earth. A red raven is the emblem of the Chinese Chow dynasty. Among the natives of the North American Pacific Coast, Raven is a hero, messenger, creator of the world, thief, and trickster. He taught the first humans how to care for themselves and make clothes, canoes, and houses. His position in Native American folklore is similar to that of the wily coyote. Some say he was born of the primordial darkness; others that he was born in the coffin of his dead mother and nourished on her entrails. He was a provident creator who brought sunlight, vegetation, animals, and the tides into the world for the benefit of humankind. He took the animals two by two onto a raft, after the manner of Noah, in order to save them from a great flood. After all the good he had done for humankind, Raven wished to marry a woman but the men refused to allow this. In revenge, Raven created mosquitoes from crushed leaves to pester them for all time. When Raven brought light to mankind, they were so frightened by it that they scattered to all corners of the world. The raven is a symbol for solitude and an attribute of several saints whom ravens fed in the wilderness, including St. Anthony Abbot, St. Paul the Hermit, and St. Benedict. Although the raven itself was considered unclean, God sent ravens to feed Elijah the Tishbite by the brook Cherith during a long drought (1 Ki 17:6; Lev 11:15; Deu 14:14). The raven has long been a symbol of divine providence (Psa 147:9; Job 38:41). Many remember the Lord's command to consider the sparrow and the lilies, but the words, "Consider the ravens, for they neither sow nor reap, which have neither storehouse nor barn; and God feeds them," are seldom brought to mind (Lk 12:24). In the Song of Solomon, the Beloved's locks are "black as a raven" (Song 5:11). The raven symbolizes filial gratitude and affection, wisdom, hope, longevity, death, and fertility. In alchemy, it represents change and the advanced soul dying to this world. It remains a frequently used symbol in modern magic, witchcraft, and mystery. Like the larger raven, the symbolic crow is associated with the sun, longevity, beginnings, death, change, bad luck, prophecy, and Christian solitude. It, too, is considered a messenger of the gods. Among ancient Greeks and Romans there were some who considered the crow a bad omen and the raven a good one. White or albino crows were so prized that fowlers tried to change the color of their baby crows by soaking them in various deadly formulas. Among the Celts, the white crow was the emblem of the heroine, Branwen. Her heroic brother, Bran, was pictured as a raven. In North America, the Kiowas taught that the white crow turned black from eating snake eyes. In the telling of myths and legends, the crow frequently took the place of the raven. This is the case in most of the Northwest Pacific myths recorded above and in the story of Apollo and Coronis. The Irish war-goddess, Badb, often took on the shape of a crow. In classical mythology, this bird is an attribute of Cronus or Saturn and Athena, the goddess of wisdom, victory, and the arts. The crow is associated with motherly love and spiritual strength. It was believed that fairies turned into crows in order to cause trouble. In heraldry, a crow was used to indicate a dark person such as a Moor or a Saracen. In Egypt, two crows, like two doves, were an emblem of monogamy. Christians consider the crow an emblem of the Virgin Mary. The words, "I am dark, but lovely...because the sun has tanned me," are believed to mean that the light or love of God has so shown upon her that she is burned and purified as if by a mighty sun or fire (Song 1:5-6). These verses also make the crow a symbol of the Church which says, "Do not look upon me [with scorn], because I am dark, because the sun has tanned me. My mother's sons were angry with me; they made me the keeper of the vineyards, but my own vineyard I have not kept" (Song 1:6). These verses are interpreted by the Church as a plea that potential converts not be discouraged by the sight of a sinful, suffering, harassed, or persecuted Church, but instead realize that the Refiner's fire and forgiveness has made her darkness more beautiful than the virginal purity implied by the whiteness of a dove. The beautiful song of the blackbird makes it a symbol of temptations, especially sexual ones. The devil once took on the shape of a blackbird and flew into St. Benedict's face, thereby causing the saint to be troubled by an intense desire for a beautiful girl he had once seen. In order to save himself, St. Benedict tore off his clothes and jumped into a thorn bush. This painful act is said to have freed him from sexual temptations for the rest of his life. Like the crow and the raven, the blackbird is considered a bad omen. However, the sight of two blackbirds sitting together is a symbol of peace and a good omen.